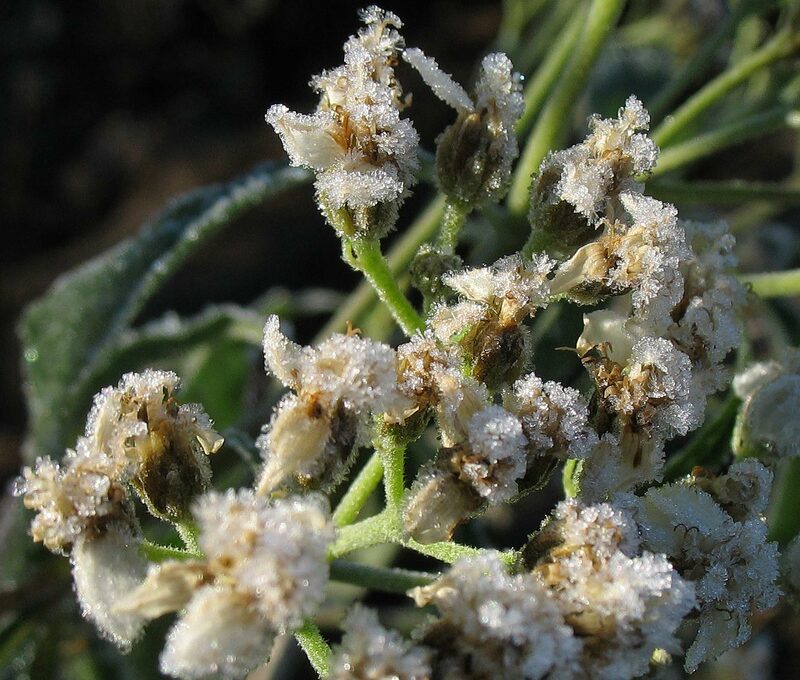 Relatively few plant species are known to exhibit crystallofolia*, delicate ice formations that form from water emitted along a stem, most commonly near the base of dormant plants during a hard freeze in late fall/early winter. *From Latin crystallus ice [itself from Greek κρυσταλλος; cf. κρυος 'frost']and folium leaf. These elegant formations have been given many names, metaphorical in nature, most commonly ‘frost flowers’ (or ribbons), a formation which is neither frost nor a flower. These common names, however, are easily confused with terms describing true frost from condensation on a cold surface as well as any picturesque ice formation. These frost metaphors are of fairly recent origin, not current with 19th Century treatments of the subject (e.g., 'frost freak' was used by several scholars). I thus propose folium, leaf, as a more appropriate metaphor, since like leaves these formations emerge laterally from the stem, and the enormous diversity of forms finds better matches with leaves than with flowers and ribbons — although this is perhaps less poetic. Perhaps more significantly, the physical process by which water moves to the ice formations is analogous to the transpiration that brings water from the roots to the leaves. My perspective is not new: German botanists in the 19th Century used the term 'Eisblatt' ('ice leaf'). Roughly 30 species worldwide were noted in the 19th Century, many of these culivated exotic plants, and the list of garden plants keeps growing as reports from enthousiasts are collected, but for native populations with relatively predictable occurrences of this phenomenon in recent years only four species have been commonly recognized in online articles: Cunila origanoides (stone mint, common dittany), Helianthemum canadense (frostweed), Verbesina virginica (frostweed, iceweed). Pictures of these ice formations abound on the web, submitted by naturalists in all sections of the country. To this can be added Pluchea odorata (marsh fleabane, sweetscent), which I was able to observe in Central Texas in 2007–2010. One species commonly cited but not documented is V. alternifolia (wingstem, golden ironweed). I am left to suspect a confusion with V. verbesina, based on a dry winter plant, since these two species are mophologically similar apart from their flowers. To test this claim Bob Kipfer in Springfield, MO, where both V. alternifolia & V. virginica occur, tagged plants of V. alternifolia when yellow flowers were available, and in the subsequent winter these plants did not produce frost (unlike V. virginica). Vernonia (species unknown) is also mentioned — questionably listed in 1885, and more recent observations have not been verified. Vernonia balwinii and Vernonia lindheimeri of Texas do not exhibit ice formations. Here too a confusion of the common name 'ironweed,' also used for Verbesina species may be involved. An example of misidentification by an established botanist who "focused on vegetation studies in Texas and Mexico" is C. H. Muller's Verbesina microptera for V. virginica (Journey to Mexico during the years 1826-to 1834, Jean Louis Berlandier; botanical notes by C.H. Muller and Katherine K. Muller, 1980). In any case, the certain naturally occurring species are all herbacious and perennial, thus maintaining a root system that overwinters. * As has been noted since the earliest observers, the ice formation far exceedes the amount of moisture from sap locally available in the stem, and must be augmented by water drawn up from the roots. But obviously not all perennial (or even biennial) herbs exhibit these formations under identical conditions of soil, moisture, and weather. And to my knowledge annual plants that produce ice bands, do so only when their roots are still active and after the frost they do not repeat the display (unlike the perennian species). * The 11 species noted by the 19th Century German botanist Caspary were exotic garden plants overtaken by a late summer freeze, and included 2 annuals. Many recent reports are also from individual garden plants. not related to the growth of a biological organism. But it [an explanation based solely on physical principles] explains too much, since no reason can be assigned why the phenomenon should not be universal and not confined to a single species. What biophysical events occur during the process? Why don't other plants, even closely related species, exhibit this phenomenon? 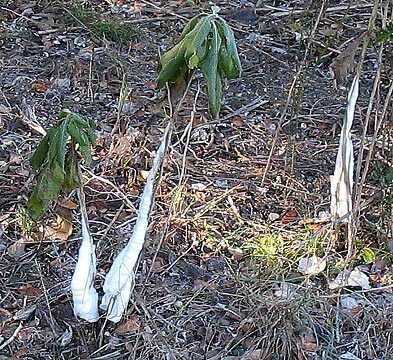 The frost flowers tend to occur at or near the base of the plants, as in the top photo. The initial formation may occur along the entire stem, but subsequent occurrences on the same plant move lower on the stem. Although the stem on the right below (both images) opened in multiple places, on December 16 it produced ice over one yard from the ground, but no 'flower' formations. The pressure from freezing was sufficient to cause the epidermis to rupture, but did not produce sufficient pressure at that height to create a flow outside the stem. The highest split was just over four feet up. The base of the stem was not ruptured, and with a 26° F freeze on December 25, these same plants produced more picturesque eruptions – shown below. Repeat performances on Dec. 29, Jan. 1, Jan. 13, Jan. 20, Feb. 13, Feb. 27 and March 8 were recorded. (There must have been well over a dozen in all, counting those not seen, but which are certain to have occurred). These grew continually smaller and were restricted to the base of the stem. Similarly, when the formation extends up for some distance its base is always larger, generally gradually tapering to the top, supporting the view that it forms primarily from moisture supplied by the roots. The pictures below were taken at the first hard freeze, Dec. 16, following over an inch of rain during the previous week. 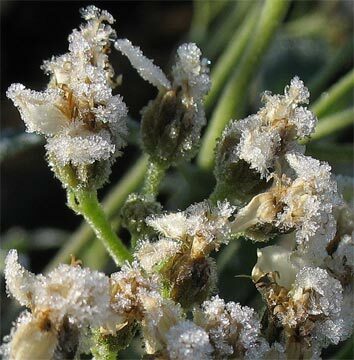 This abundant moisture, of course, also supported a strong general condensation frost, similar to that shown with the ice crystals on flowers at the top of the page. Once the stem has ruptured in this manner, subsequent formations tend to be smaller and move closer to the stem base. Compare the formations of January 13 — the tenth event for the two above plants, including one frost of 16° F (not photographed). The formations occurr at the very bottom, and seem more randomly structured — ribbons relatively narrow, sometimes with ice extending upward along the pale woody secondary xylem. Small group of plants with ice replaced with red dots. Ice formations often circle the stem. The two tall repeat plants shown above. The smallest form, 1/2 inch wide. Contrary to numerous descriptions, the stem itself doesn't split. The epidermis ruptures along with the cortex and other tissues that seem tightly bonded to it. This is most apparent from pictures taken five days after two hard frosts (December 16,17) that produced the above ice formations. The four pictures below show the stem with its outer layers detached from the very hard secondary xylem — photo on the left — and three transverse sections referenced to the areas indexed A,B,C. In section A, above the split, the cortex is already dry. In section C, below the split, the cortex is still green. Water can be seen emerging from the cells in the bottom. This portion could conceivably have yet produced ice formations with appropriate temperatures. [The remaining base stub of one such cut stem did in fact yield crystallofolia numerous times through Jan. 20.] Section B shows that the epidermis and cortex have separated from the central woody area. Note the scalloped edge of the secondary xylem and xylem rays where the cortex was only loosely bonded. Instances where the woody core has split open seem to result from water having entered it after the rupture of the epidermis followed by a subsequent freeze, especially with stems that are not vertical. Transverse sections at points A, B, C on the left. In the following picture, the green areas of the peripheral stem layers are obvious. The stem itself does not split. The ice formations seem to radiate from a multitude of points at right angles to the central vascular xylem, perhaps guided away from the center by the tissue that was pushed aside when the stem ruptured.